William Branham thought that the Great Pyramid was built by Enoch as a message from God. He also believed that the Great Pyramid of Giza never had a capstone(at the top) and this was part of the message that God sent by Enoch to the world (even though it is not in scripture). William Branham also believed that the Egyptians were much more intelligent and more advanced than we are today. They had atomic power, which they misused, causing the great flood which destroyed the earth. Since, as can be seen below, this is not in agreement with known facts from history and archeology, one must ask the question - where did William Branham get this from? Did he simply make it up? 1 Who built the pyramids? 3 Did the Great Pyramid ever have a capstone? 4 Do the pyramids cast a shadow? William Branham believed that Enoch built the pyramids. However, there is absolutely no evidence of this. Giza is the location of the Pyramid of Khufu (also known as the "Great Pyramid" or the "Pyramid of Cheops"); the somewhat smaller Pyramid of Khafre (or Kephren); the relatively modest-sized Pyramid of Menkaure (or Mykerinus), along with a number of smaller satellite edifices known as "Queen's pyramids"; and the Great Sphinx. Based on a mark in an interior chamber naming the work gang and a reference to fourth dynasty Egyptian Pharaoh Khufu, Egyptologists believe that the Great Pyramid of Khufu was built as a tomb over a 10 to 20-year period concluding around 2560 BC. The Pyramid of Khafre is the second-tallest and second-largest of the ancient Egyptian pyramids of Giza and the tomb of the Fourth-Dynasty pharaoh Khafre (Chefren), who ruled from c. 2558 to 2532 BC. The Pyramid of Menkaure's date of construction is unknown, because Menkaure's reign has not been accurately defined, but it was probably completed in the 26th century BC. And they were much better scientists than we have today. Go down in Egypt and look at the pyramids setting in the middle of the earth. No matter where the sun is, there's never… Geographically, it's in the center of the earth. There's never a shadow around it, no matter where the sun is. How'd they do that? And these boulders, at least two city blocks high, that weigh a billion tons, how'd they get them up there? Produce something now that'll lift them up there. They can't do it. They can't make mummies today, as they did in them days with the body. They can't embalm like they did. None of those things. They were smarter, really than they are today. First off, the individual stones that were used to make up the pyramids are not even close to weighing a billion tonnes. Just do this simple internet search: how much do the stones in the pyramids weigh? A modern construction management study estimated that the total project required an average workforce of 14,567 people, a peak workforce of 40,000 and would have taken around 10 years to complete the Great Pyramid from start to finish. So while it would be very hard, two or three people could pull the 2 tonnes for a small pyramid stone on a tree type rolling system. And 80 people (or less) could likely pull the largest stone. But since they had over 10,000 people, what's the problem with that? The early Greeks had a crane that was able to lift around 20 tons. Today we have cranes that can lift 20,000 metric tons. So to say that it could never be done even today is, at best, an ignorant statement. We could build the Great Pyramid today and it wouldn’t require aliens or technology (from the smart Egyptians) that we do not have today. As impressive as the Great Pyramid is, its engineering problems are known and solvable. Engineers like Jean Pierre Houdin have articulated in detail how the pyramid could have been built without modern machinery. And why did William Branham fail to mention the failed pyramid projects? Have you ever heard of the pyramid of Huni (it collapsed) which was built during the reign of Sneferu, the father of Khufu? Were those just dumb Egyptians? What about the Bent Pyramid or the Step Pyramid of Djoser, which was built in stages. These are all examples of human engineering — the Egyptians learned how to build pyramids gradually, trying new techniques and learning from failures. Pyramid engineering evolved through various transitions. The pyramids themselves demonstrate this quite clearly. There is no support for the statement that the Egyptians were smarter than we are today. It is also astounding that William Branham failed to check his facts and that they are so far from the truth. Did the Great Pyramid ever have a capstone? William Branham taught that the reference to the cornerstone in Psalm 118:22, Matthew 21:42, Mark 12:10, Acts 4:11, and 1 Peter 2:4 are all references to the fact that the Great Pyramid does not have a capstone. ...built on the foundation of the apostles and prophets, Christ Jesus himself being the cornerstone, in whom the whole structure, being joined together, grows into a holy temple in the Lord. 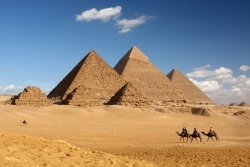 As indicated above, the Great Pyramid was built as a tomb for the pharaoh Cheops and was completed around 2560 BC. At completion, the Great Pyramid was surfaced by white "casing stones", blocks of highly polished white limestone. It was then topped by a capstone or pyramidion (called benbenet in the ancient Egyptian language). The pyramidion was generally covered in gold to reflect the rays of the sun. The capstone and the limestone casing were removed over the millenia by a combination of earthquakes and looters. We can therefore conclude that William Branham was wrong on two counts: he didn't know what a cornerstone was, and he didn't know his history. So how can his theological conclusions on this issue be correct? Do the pyramids cast a shadow? William Branham said that the Great Pyramid was "so perfect in the center of the earth, no matter where the sun is, there's never a shadow around it." This statement is blatantly false. In fact, Thales of Miletus (c. 624 – c.546 BC), a pre-Socratic Greek philosopher and mathematician, measured the height of the pyramids by their shadows at the moment when his own shadow was equal to his height. The sides of the Great Pyramid are at 52 degrees. Therefore, if the sun is higher than 52 degrees, the Egyptian pyramids won't cast a shadow. The sun is never directly overhead at summer solstice given that the latitude of the pyramids are at 30 degrees north. The sun is only overhead at 23.5 degrees latitude, the Tropic of Cancer. During the winter months, the pyramids cast a shadow for considerable parts of the day. Even in the summer months, when the pyramids don't cast a shadow during large parts of the day, they still cast a shadow in the early morning and evening. Interestingly, if the Great Pyramid were located in Toronto, Canada, it would still not cast a shadow on the summer solstice, because the sun is above 52 degrees in Toronto on that date. So again, we find that William Branham was simply wrong on this issue. He failed to check the facts. God is from above. He's writing the zodiac in the sky. Zodiac starts with the Virgin, the first coming of Christ, ends up with the Leo, the Lion, the second coming. And He's writing His first Bible. There's three of them. One of them was written in the skies, one in the pyramids, one on this. Everything in God is in a trinity, like a man's in a trinity. All right. And they were much better scientists than we have today. Go down in Egypt and look at the pyramids setting in the middle of the earth. No matter where the sun is, there's never... Geographically, it's in the center of the earth. There's never a shadow around it, no matter where the sun is. How'd they do that? And these boulders, at least two city blocks high, that weigh a billion tons, how'd they get them up there? Produce something now that'll lift them up there. They can't do it. They can't make mummies today, as they did in them days with the body. They can't embalm like they did. None of those things. They were smarter, really than they are today. And those pyramids, why, up there, over a city block high, in the air, there's tons. There's boulders up there almost as big as this tabernacle. They couldn't put them up there today if they had to. So they did it some way. And then, the sphinx, I think it takes sixteen flat cars for its leg to lay on. What about its body? And it sets way in the air there. How did they get it up there? See, they were--they were people that had secret intelligence that we don't have today. I think we have it, but we just haven't advanced with it, atomic or something like that. Because electric powers, or no powers like that, could lift it. But they built it then. And that pyramid, the big pyramid setting there, geographically, is so perfect in the center of the earth, no matter where the sun is, there's never a shadow around it. Engineering, we got a lot of--long ways to come, to compare with them. And to think, that's been more than right on five thousand years ago, they had that. It's built right up like this to a point. And the stone on the capstone never was found. They never did put a cap on top of the pyramid. I don't know whether you know it or not. The big pyramid of Egypt, it never had a top stone on it. Why? The Capstone was rejected; Christ, the Headstone (See? ), was rejected. Now, the second thing He wrote, Enoch, in the times of the pyramid, down in Egypt. I've been there and perhaps many men in here and women has been there. You notice those pyramids, we couldn't reproduce them. They're too great, too gigantic. They're so geographically in the center of the earth, no matter where the sun is, there's never shade around them. And they got tons and tons and tons of boulders up there, that they argued about that once. We used to debate it in school, how they built it. Well, the fellow of my point said, "They rolled it up." But they built it. They could achieve it. They had a--a way of doing it; maybe atomic power, or hydrogen power, or something. But gasoline power and electrical power, you couldn't make machine big enough to lift it up there. So how'd they get it up there? And it's so perfect masonry, till you can't run a razor blade around the--the places where they're setting together, hundreds and hundreds of tons. How did they do it? How did they build them? They could make a mummy, take a body and embalm it that still has features looking right today, after around almost four thousand years ago, still looks natural. A coloring that we can't duplicate at all. They were smart, intelligent. Jesus said, "As it was in the days of Noah, so will it be in the coming of the Son of man." Now, I don't whether I'm going to have time this morning: going to do the best I can to show you that these steps are in the pyramid just exactly, the second Bible God wrote. Enoch wrote them and put them in a pyramid. There was a pyramid after that, Enoch, which testified exactly. We wouldn't have time to go into it, but, someday, by God's help, I'll show you, just exactly draws the dimension of the hour we're living. See? Notice, but this geographical measure now that we have, who dimensions are the same, doesn't necessary mean that it has to be a--a cube. Notice, this would answer Egypt's... or the Enoch's sign in Egypt. Like Enoch, who built the pyramids, that we believe. And the capstone never was put on top of them, because the headstone was rejected. And we taken now, not as Doctrine, but as to understand, just for the church here. ↑ Vyse, H., Operations Carried on at the Pyramids of Gizeh in 1837: With an Account of a Voyage into Upper Egypt, and an Appendix. Vol I. London: James Fraser, Regent Street (1840). ↑ The Holy Bible: English Standard Version (Wheaton: Standard Bible Society, 2001), Ac 4:11. ↑ David J. Williams, Acts, Understanding the Bible Commentary Series (Grand Rapids, MI: Baker Books, 2011), 82. ↑ The Holy Bible: English Standard Version (Wheaton: Standard Bible Society, 2001), Eph 2:20–21. This page was last edited on 20 April 2019, at 01:18.